If you’re in a hurry and looking for the best mattress for bunk beds, then the Signature Sleep Memoir Memory Foam Mattress is the best one. As adults, we all have a fine appreciation of the importance of a deep, restful night of sleep to our overall well being. But can you imagine the impact of a good night’s sleep on the health of children? This is one of the many factors which should drive you when shopping for the best mattress for bunk beds. Keep in mind that uncovering the right one may require a lot of effort and skill unlike traditional mattresses for adults. With the huge technological innovations in the mattress industry at the moment, making the right choice can seem Herculean. This is why we’ve compiled comprehensive reviews of the best bunk bed mattresses below for your convenience. 10.1 Is Sleeping on the Top Bunk Safe? 10.2 What is the difference between Bunk and Loft Beds? 10.3 Should Bunk Beds Feature Stairs? 10.4 Are Bunk Beds Safe for Toddlers? Before you go out and order a bunk bed, it is important to be sure of what you want specifically. Once you have that under your belt, just pay attention to the most important attributes and ignore the rest. Here are the most critical factors to watch out for. The most common mattress size for bunk beds is the Twin and Twin XL. In recent times, a few brands have also made available a new size known as the “Narrow Twin” which has been touted as specifically optimized for bunk beds. Always consider the size of bed frame you own and buy accordingly. Also, don’t forget to take the sleeper’s body size into account during the shopping process. For instance, if you’re buying a bunk bed for an adult or heavy teen, a Twin XL may be more advisable. Innerspring and foam mattresses are the 2 main types prevalent in the bunk bed market at the moment. However, each one comes with its own positives and drawbacks. Therefore, the type of foam material you end up choosing may largely depend on your personal preferences during shopping. From Millennials to Baby Boomers, many of us grew up on innerspring mattresses and have gotten so used to them that sleeping on anything else feels awkward and uncomfortable especially in the beginning. These mattresses feature a set number of steel coils which typically determine their degree of firmness. One of the main reasons why they continue to be so popular is due to the extra bounce they provide. These types of mattresses are also genuinely sturdy and built to last through several years of routine use. Additionally, most spring coil bunk bed mattresses are extremely breathable which can be lifesaving for those of us who live in hotter climates or prone to night sweats. The downside is that dust mites and other allergy triggers thrive in these types of mattresses. If you or your children suffer from severe allergies, staying clear of innerspring models could be a wise decision. 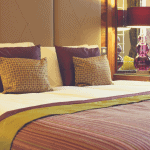 There is a wide range of options available when it comes to foam mattresses. Memory Foam, Latex Foam, and Polyurethane Foam are the most prominent types on the market. Choosing a foam mattress for use on a bunk bed is not necessarily a bad idea. In fact, there are so many 5-star options available on the market and a quick glance through our reviews can help you uncover them. However, traditional foam mattresses are known for their terrible heat dissipation which can be severe especially during summer. 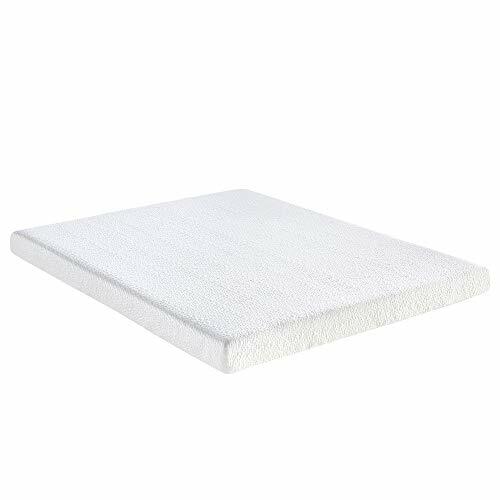 Therefore, memory foam models integrated with layers of cooling gel make the best foam mattresses for bunk beds thanks to their quick and efficient heat disposal. 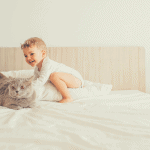 Foam mattresses are great for those of us with allergies as many of them are naturally hypoallergenic, ensuring that dust mites, bacteria, and other allergens are effectively eliminated. Thickness should be another critical factor to consider especially among heavy teens and adults. This is because thicker mattresses tend to provide better weight support and increased comfort for sleepers. The good news is that standard twin mattresses typically come with enough thickness to support those weighing 250 pounds or so. When shopping for a top bunk bed mattress, make sure to choose a model that is no more than 6-7 inches thick. Anything thicker and you risk the mattress stretching further than the guardrails which can make the sleeper susceptible to falls and resultant injuries. The good news is that some bunk beds come with specially designed guardrails which are significantly higher than the standard ones on the market. If your bunk bed features this style then you can afford to purchase a mattress which is up to 12 inches thick without any fear of putting the sleeper at risk of falling. A low profile mattress is also recommended for bottom bunk beds. Remember, the thicker the mattress, the less headroom is available to the sleeper. Also, thicker bunk bed mattresses can be difficult to lift and move around when tucking sheets underneath it. Therefore, we recommend that you choose a model which is no more than 8 inches thick but provides massive comfort instead of buying one that is too thick to the point of discomfort as this could end up leaving you with nightmares down the line. There’s no ideal firmness level that suits the needs of everyone. Firmness is strictly a matter of personal preference. What might be too firm for one person may be deemed soft by another so you should always choose based on the individual needs of the sleeper. 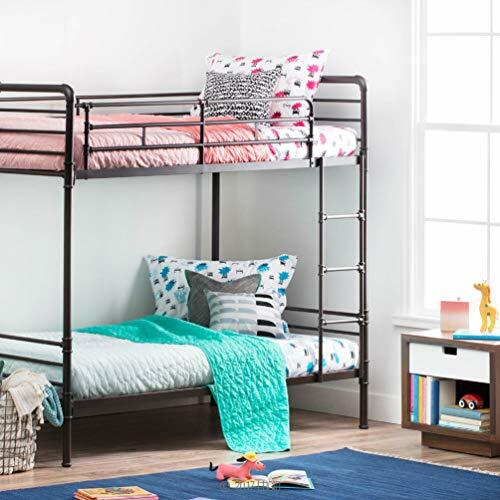 What if you’re shopping for a bunk bed for kids? Well, we recommend that you speak to them to find out what they want. In fact, their input could put the firmness problem to bed once and for all. Just ask the child whether he or she prefers a soft or medium firmness mattress and you’ve got work cut out for you. Customer reviews are a great way to get a feel of what a particular model brings to bunk beds even before purchase. The good news is that retail giants like Amazon allow customers to leave independent reviews and rate their experiences for every single item purchased including mattresses. Once you find a potential bunk bed mattress you like, a quick glance through its reviews can help you decide whether it’s a good fit for your needs or not. The Signature Sleep Memoir Memory Foam Mattress literally brings your bunk bed dreams to reality. 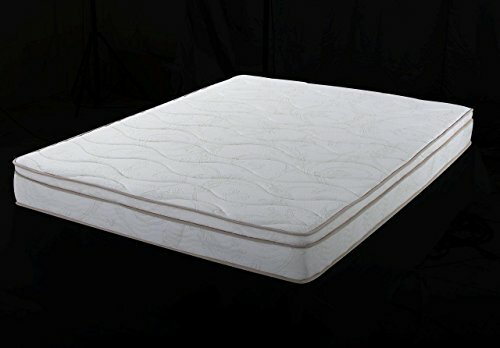 It comes in a spectacular blend featuring 1.5 inches of 5-star memory foam at the top, augmented by 4.5 inches of high-density support foam. 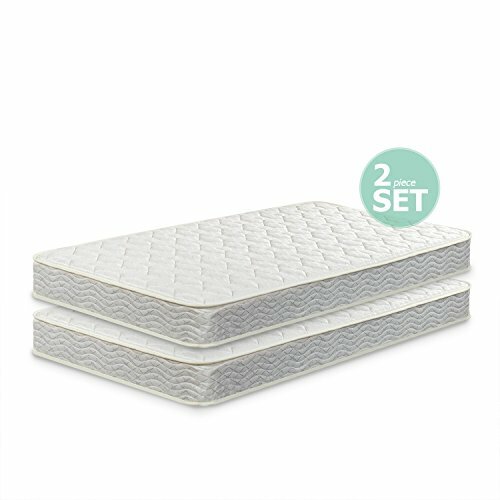 This results in a plush and sturdy sleeping platform whether you’re on the top of the bunk or below thanks to the excellent molding features of the memory foam component as well as the durability of the supportive foams. It fits snugly on both wooden and metallic bunk beds and delivers restful sleep whether you a fan of lying on the side, back, or tummy. Apart from bunk beds, this model is also suitable for all kinds of sleeping platforms including trundle beds, hard floors, and traditional wooden or metallic bed frames. The Signature Sleep Memoir Memory Foam Mattress is the obvious choice if you want a guaranteed night of deep beautiful sleep on a bunk bed. This bunk bed mattress remains a top draw among consumers looking for that distinct feel of luxury without having to pay an arm and a leg. It is manufactured from some of the finest materials in the industry today including Green Certified Foams that deliver world-class functionality and durability. The Home Life Euro Top Harmony Mattress delivers exceptional support and firmness levels which feel just right, thanks to the 15-gauge pocket coils encased into them separately to eliminate unnecessary motion. This bunk mattress also beats expectations in terms of price. Additionally, it works well for all sleeping positions. The only downside is that some sleepers report actually feeling the springs while lying on the mattress and this can be a bit uncomfortable for those who aren’t used to sleeping on innerspring mattresses. If you’re looking for an ultra supportive yet affordable bunk bed especially for a bad back, the Home Life Euro Top Harmony Mattress is the best choice. The Zinus Green Tea Mattress is the perfect replacement for a worn out bunk bed mattress for both adults and kids. It comes in a specially designed “Narrow Twin” size that fits bunk beds to absolute perfection. However, you can choose to play it safe by opting for the regular Twin version which is available in multiple depths such as 8, 10, and 12 inches. Zinus relies on the industry-changing BioFoam, which is an advanced form of memory foam infused with natural oils and minimal petroleum-based materials, unlike regular memory foam models. This bunk mattress is also integrated with natural green tea extract oil to keep the bunk bed smelling fresh always by eliminating odors and bacteria. Additionally, the zipped cover is easy to remove and machine washable so you’ll never have to worry about accumulated dirt and stench over time. Buy the Zinus Green Tea Mattress if you want a model that can withstand various forms of dirt and bacteria while staying fresh throughout its lifetime. 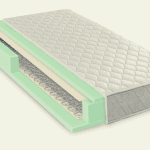 The LUCID 5 Inch Gel Memory Foam Mattress is another popular option on the market right now. Manufactured by a leading name in the mattress industry, this model offers guaranteed luxury to kids and adults who sleep on bunk beds for one reason or another. 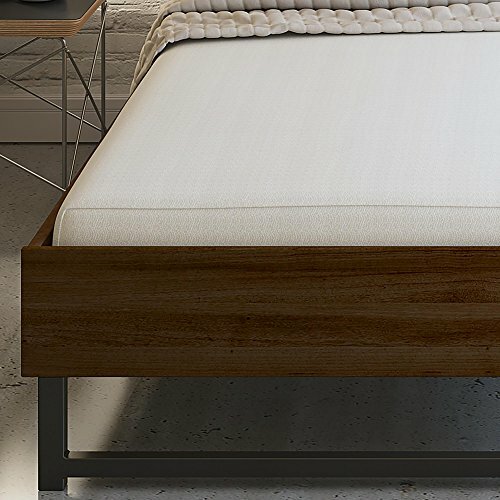 Several inches of quality gel infused memory foam sits at the top layer of this bunk bed mattress to provide the perfect amount of cradling for adults and little ones. While bunk beds may feel a bit strange initially for kids who’re used to sleeping on traditional beds, the level of comfort provided by this mattress means there’s really no difference in terms of comfort. The 5-inch thickness makes it a perfect fit for all kinds of bunk beds without compromising on comfort and stability. The LUCID 5 Inch Gel Memory Foam Mattress should be seriously considered when you’re in the market for a great thin bunk bed mattress. The superior finish of this bunk bed mattress is irresistible. In fact, many parents say their kids fall in love with it immediately their eyes make the first contact. The Classic Brands Mattress stays in its original shape and easily folds into the bodies of sleepers in order to provide ample support for the most critical pressure points to prevent body sores and other forms of pain. This bunk bed mattress is naturally hypoallergenic and provides exceptional resistance to allergens such as bacteria, molds, and dust mites. This prevents triggering of allergies which can lead to significant discomfort and other health issues among kids and adults. Also, it is CertiPUR-US certified for durability, performance, and environmental responsibility. The Classic Brands Mattress is the best option when buying a hypoallergenic bunk bed mattress that provides excellent orthopedic support and comfort. This innerspring bunk bed mattress continues to attract awesome reviews from current and past owners. The My Green Mattress Certified Organic Mattress features triple-zone pocket coil springs designed to deliver world-class lumbar support and perfect body contouring as well as significant reduction of motion transfer. It is proudly made in the United States by a manufacturer committed to the use of the most environmentally friendly materials including All Natural Eco-Wool and GOTS Certified Organic Cotton. Additionally, the whole manufacturing process is executed without using potentially harmful materials including chemical flame retardants and polyurethane foams. Not sure whether this bunk bed mattress is perfect for you? Take advantage of the manufacturer’s 100-Night sleep trial to check it out and decide once you get some first-hand experience. Each purchase includes a 25-year fool-proof warranty for manufacturer defects and other common issues. If you’re looking for a top-notch innerspring bunk bed mattress made from Green materials, it doesn’t get better than the My Green Mattress. The Zinus Spring Twin Mattress is engineered with a flawless combination of sturdiness, durability, and style. It is suitable for toddlers, preteens, and young adults ready to take the world by a storm. The topmost layer is integrated with the highest quality foams certified by CertiPUR-US for innovation, durability, and emissions. This essentially means you’re guaranteed a great night of sleep on a daily basis without actually feeling the Bonnell steel coils beneath the mattress which are built to provide strong support for sleepers. These coils are manufactured from heavy-gauge steel to deliver adequate and long-lasting support regardless of the sleeper’s weight. 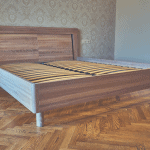 Apart from regular bunks, this mattress also fits daybeds and trundle beds without problems. 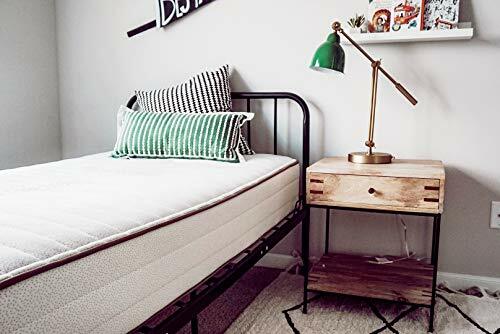 The Zinus Spring Twin Mattress should be top of your list when looking for a smart bunk bed mattress that has what it takes to provide reliable support and comfort for many years. There can be tons of questions on your mind when searching for the right bunk bed mattress. Here are our answers to a few common ones. Is Sleeping on the Top Bunk Safe? The moment kids start asking for bunk beds, many parents begin wondering whether these beds are safe enough because of the risk of falls and injuries. Well, the answer is Yes. Kids should be able to sleep comfortably and safely on the top bunk without any problems (in most cases). However, making sure that a particular bed is built with durable materials to ensure sturdiness and safety is always crucial. Once you tick the box for Build Quality, Guardrail Height should come up next. Always choose a model with a much higher guardrail as this can allow you to invest in a thicker bunk bed mattress model without putting your precious son or daughter’s health at risk. Remember, there are additional risks associated with putting kids on bunk beds such as strangulation and it is important to observe the highest safety practices to ensure minimum risk of falls, trips, and other minor injuries. What is the difference between Bunk and Loft Beds? Many children reach a phase where they fall in love with bunk beds and if your child has gotten to that point then it is only normal that he or she starts nagging and lobbying until you give in and splash out on one of these space-saving beds. To be honest, bunk beds come with so many advantages due to their compact sizes. However, if you have only one kid and have no plans of adding to your family anytime soon, a bunk bed may be a waste because only one of the beds will be utilized most of the time. Well… this is where Loft beds come in. Loft beds are bunk-style beds featuring a single bed at the top with the down part designed for use as a storage area, desk, and chair, or extra space for playing. When looking for the best loft beds, always take into account the safety features outlined for bunk beds in order to guarantee the safety of your child. Should Bunk Beds Feature Stairs? The answer is Yes… in my opinion. Sure, stairs may use up more space than a simple ladder but they can be safer for younger kids who may be prone to slips and falls. If your kids are much older, then they should have no problems climbing down and up the top bunk on a ladder which takes up less space. 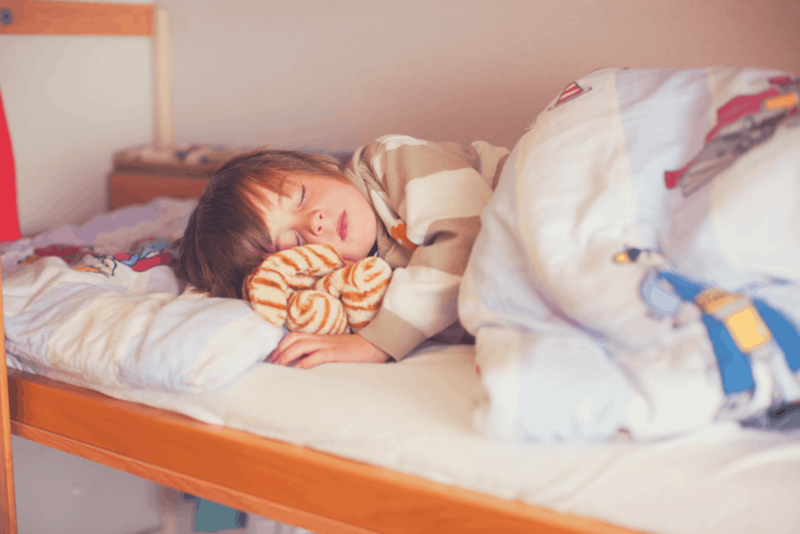 Are Bunk Beds Safe for Toddlers? Many kids start angling for bunk beds right from around age 5 but unless you have much older kids you can reserve the top bunk for, it will probably not be advisable to shop for a bunk bed at this point. 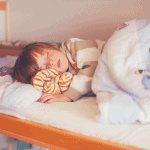 Experts believe kids should only be allowed to sleep on the top bunk after turning 7. It is quite obvious that there are loads of great options when it comes to bunk bed mattresses. That being said, I believe the Signature Sleep Memoir Memory Foam Mattress is the best mattress for bunk beds right now. When you factor in its ability to evenly distribute weight and allow consistent molding to the sleeper’s body, it doesn’t take a genius to note that this model stands tall among its peers. Additionally, it is manufactured to meet Federal Flammability Standard 16 and a host of other safety requirements.